Art Glass Nelson is located to the right of the Nelson Cathedral at the end of Trafalgar Street, is a very photogenic little building and a very special glass design gallery. Let’s step inside shall we…. 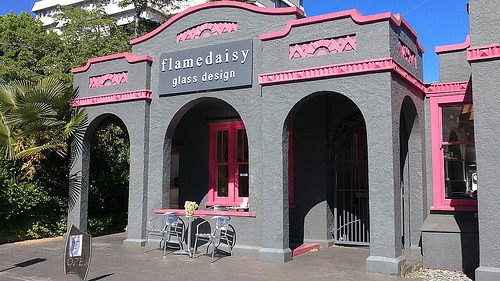 Flamedaisy Art Glass Nelson is NOT about blending into your décor but about challenging your senses with it’s strikingly elaborate shapes and colours. You won’t find any don’t-you-dare-touch displays here. 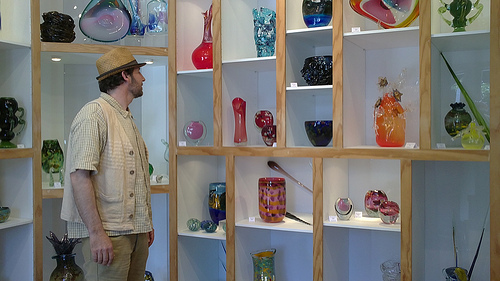 Co-owner and glassmaker, Anthony Genet actually encourages people to handle the glass on display. Just thinking about it gives me the collywobbles! 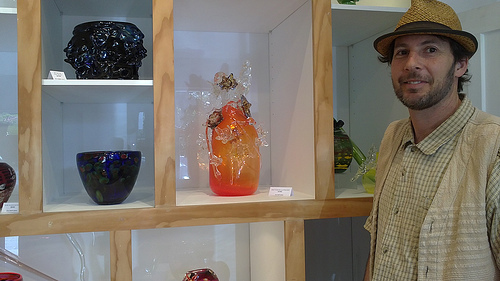 Since 1999 Anthony and Berinthia Binnie-Genet have been providing a very special experience for our overseas travellers where they not only get to view the art but to also watch the glassblowing process in the studio. And by prior arrangement and for a modest fee, visitors can have a go at making their special piece to take home. Plus you get to chat with the artists and meet the locals. See that gorgeous blood-red orange glass sculpture? Yep, the one directly to the left of Anthony from Art Glass Nelson…it’s calling out to me…and maybe to you, dear traveller. Nelson is a pocket of paradise in the top northwest corner of the South Island, Nelson has a positive, creative attitude to life – and it’s easy to see why. This region is the sunniest in New Zealand and has attracted more than 350 working artists and craftspeople. Their work is often inspired by the region’s exceptionally beautiful geography – coastal, forest and valley landscapes provide places to wander and dream. The weather is perfect for outdoor pursuits.